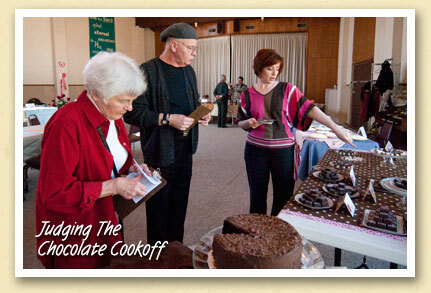 On Saturday, the Bryson City Presbyterian Church’s Fellowship Hall became the Calorie Capitol of the Smoky Mountains as twenty area chocolatiers competed in the Third Annual Chocolate Cookoff. The event is a fundraiser for the Friends of the Marianna Black Library. This year’s judges (above l-r) were Bryson City Mayor Pro-Tem Kate Welch, owner/chef Richard E. Long of Caffe Rel in Franklin, NC and Asheville TV news anchor Victoria Dunkle of WLOS Channel 13. (left) Chef Long admires the delicate detail of Fran Brooks and Becca Wiggins’ miniature Chocolate Cones, which won both the judges’ first place and the People’s Choice awards. Second place went to Robin Hamilton for her Killer Kahlua Chocolate Mousse Cake, and Diane Cutler’s Chocolate Orange Brownies came in third.